​As chapter thirteen of Acts opens, the Holy Spirit sets aside Barnabas and Paul for mission and inaugurates their first journey (13:2). They travel about, proclaiming the message in the synagogues (13:4-5). Some receive them favorably (13:7), while others oppose them (13:10-11). The narrative makes it clear that the Lord is at work in these events. The mission is initiated by the Holy Spirit and directed by God. It easily overcomes any opposition. The speech in the synagogue in Antioch of Pisidia is the centerpiece of the first missionary journey. It is unusual among Paul’s speeches on several counts. Only this speech and Paul’s last speech to the Jewish leaders in Rome (28:17b-20, 25b-28) are directed to a largely Jewish audience. In content and structure, it is similar to Peter’s speeches in the opening chapters of Acts. This is the first of three representative speeches by Paul to three distinct groups (Jews, Gentiles, Christian believers). The specific circumstances of this speech make it unique. In addition, this inaugural speech of Paul is rich with the content of the gospel that he preaches. When Paul arrives in Antioch of Pisidia, he goes first to the synagogue where his group is invited to address the congregation. The context is worship and the reading of the “law and the prophets.” Paul stands and speaks, arousing interest and a desire for more teaching. However, the initial positive reaction quickly turns to opposition, which, in turn, provokes Paul and Barnabas to announce that they will turn to the Gentiles. The verses in our passage frame the complex and lengthy speech that Paul delivers in Antioch in Pisidia. In that speech, Paul begins by reviewing salvation history as had Stephen before him. Stephen recalled events from Genesis and Exodus: the story of Abraham, that of Joseph and the migration into Egypt, and Moses’ leadership of the people. The review emphasized the people’s rejection of Moses, and Stephen drew harsh conclusions regarding the stubborn rejection of Jesus by his contemporaries. Paul reviews events from Deuteronomy, Joshua, Judges, 1 and 2 Samuel, and 1 and 2 Kings. He speaks of the deliverance from Egypt, the giving of the Land, God’s raising up of judges, and the people’s clamor for a king. Paul’s review is not as critical as Stephen’s. Nevertheless, the unifying theme of all these OT books is the people’s continual rejection of the Lord. Paul’s words have the same implication: that God has been constantly active on behalf of his people, but the people have rebelled against the Lord all through their history. Paul then connects this history to the coming of John the Baptist and Jesus. Although Paul is reviewing Israel’s history, his purpose is Christological. In the second part of the speech, Paul reminds his hearers that the present generation has once again rejected God’s will by rejecting Jesus. Paul then reaches the Christological heart of the matter. The one they rejected, God has raised. Next, Paul engages in a series of midrashic interpretations of Scripture passages reminiscent of Peter’s use of Scripture at Pentecost. Finally Paul exhorts his hearers to believe so that their sins may be forgiven, and lest they go the way of all those who previously opposed God’s will. Similarly, Peter concluded the Pentecost speech with a call to repentance. Repentance is an important Lukan theme, but here there is a hint of the Pauline notion of justification. Believing in Jesus will result in freedom from sin. At this point, the passage for the Fourth Sunday picks up with the report of the positive response to the preaching of the gospel by gentiles and the increasing hostility of some of the Jews in the city. Having already given a context for such opposition in his review of Israel’s past, Paul and Barnabas now cite the same tradition in support of the gentile mission. Of course, Acts itself has a strong interest in this critical moment when the gentiles respond and it is no surprise that it would relate this message. This Psalm of praise brings to a climax a series of enthronement Psalms. It is especially suited to accompany these readings because echoes two critical themes: the call of the nations (gentiles) to the worship of the Lord and the image of God as shepherd to His people. It is not, we should note, a moment to abandon the Lord's chosen people, but a joyful recognition of the universal sovereignty of Israel's God. This passage from Revelation offers a stirring vision of the number and diversity of God's reconstituted people. The promises of God and the prophecies of old have come to pass - the faithful remnant has become a might flood of those brought into right relationship with God by the grace of His Son. The language here uses baptism imagery - notice the white garment and the springs of life giving water. This same language recalls the ministry of Jesus - especially as recounted in the Gospel of John. In that Gospel's passion account, we heard about the undivided garment of Jesus and the spring of water that flowed from His side at His death. 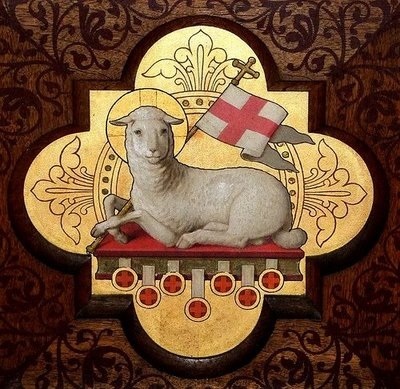 Likewise the image of the Lamb figures prominently in that gospel. Revelation addressed Christians suffering terrible persecution - imprisonment, torture, and death. This image of the Lamb becomes especially poignant for them. The Lamb is the polar opposite of the ferocious, domineering violence of their Roman persecutors. And yet the Lamb, gentle and peaceful, has the victory. And His victory is shared with His flock who grasp the palms that symbolize victory. Jesus' use of the image of shepherd and sheep has biblical precedent. Who can forget the poetry of the 23rd Psalm: "The Lord is my shepherd..." Nonetheless, John's Gospel offers the ancient metaphor in a startling new context. First, this gospel makes it clear that it is now Jesus Who is Shepherd to the people. John makes it clear that this Jesus is more than holy man or prophet - He does the work of God: reconciling, healing, guiding, and giving life. In this passage we also hear a new use for the metaphor. The emphasis in this brief passage is on the intimacy of the relationship between Jesus and His disciples. In these few words, we see the enormity of the intense personal love that Jesus exercises for them and for all of His disciples - "there is no greater love than to lay down your life for a friend!" In John's Gospel, we hear Jesus pray for His disciples in deeply personal terms. We learn that his ministry and His self gift on the cross are for their redemption. He Who enjoys perfect communion with the Father, will now draw them into that same intimacy of love and trust.